Stay healthy and strive for the body of your dreams with two of nature’s superfoods. Acai is the most nutrient-dense berries available today, and studies have shown that the fruit assists in the processes that burn fat and promote good health. On top of providing many antioxidants, acai berries are also believed to help control appetite hormones, and increase energy and metabolism, meaning you can burn more calories throughout the day. 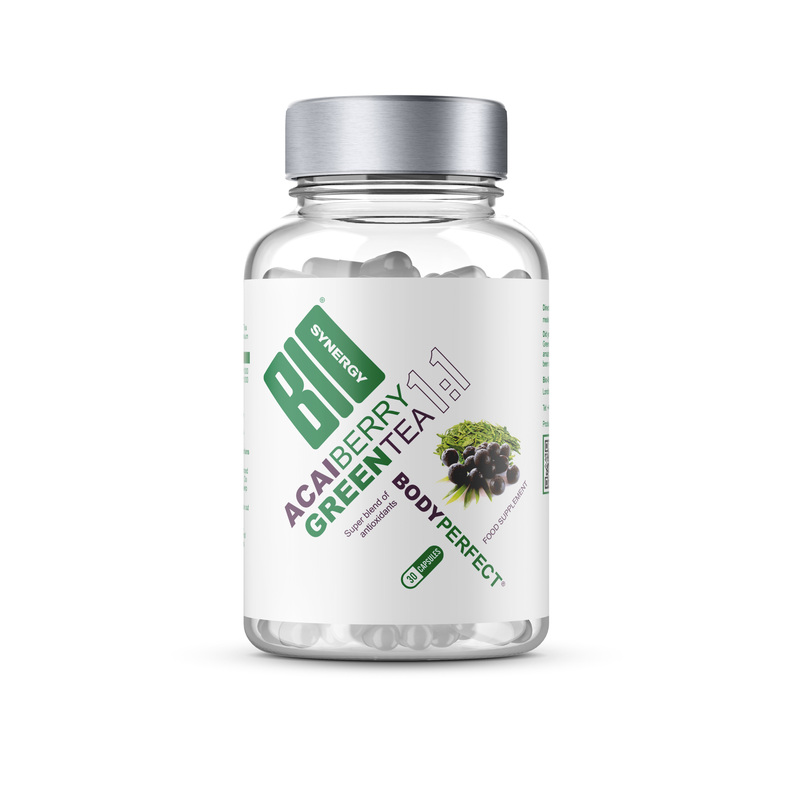 Bio-Synergy has combined this superfood with another powerful source of antioxidants, green tea. The catechins and EGCG found in green tea have a long track record of reducing cravings and giving a natural lift to the body’s metabolic rate. So, with Body Perfect® Acai Berry & Green Tea, you get two of nature’s most effective nutrients to help you manage your weight and health..
With Body Perfect® Acai Berry & Green Tea, you get a 100% natural yet powerful combo of antioxidants and anti-carcinogens, with the potential to help you reach your weight loss goals. Our super formula of all-natural ingredients brings you the best of two worlds. Acai berries are one of the most nutritious fruits in the world. Some studies show that acai is even richer in protective antioxidants than cranberries, raspberries, blackberries, blueberries or the goji berry. Recent studies have shown that the fruit has certain appetite-suppressing abilities due to how it effects various hormones that control blood sugar levels and feelings of hunger. It appears to also improve metabolic functions, such as boosting digestion and breaking down of fats. Until recently, the acai berry was only available in Brazil as the fruit perishes within a day, making it unsuitable for shipping. With recent advances in flash freezing, all the benefits of acai are now available in Bio-Synergy Acai Berry supplements, which pack all their natural goodness into an easy-to-swallow tablet. Our super formula also contains green tea from unfermented leaves. This ingredient reportedly contains a higher concentration of antioxidant polyphenols than any other food source. These antioxidants can neutralise free radicals and can reduce or even prevent some of the damage they cause. Green tea may also help you lose weight thanks to it being a rich source of catechins and EGCG. These antioxidants seem to have a thermogenic (fat burning) effect on the body. Also, tea contains caffeine, which is well known to boost energy levels and increase metabolism. As a rich source of antioxidants, acai berry may help to fight cancer by targeting the underlying cause of cancer formation; high levels of free radical damage and inflammation. IS BODY PERFECT® ACAI BERRY & GREEN TEA RIGHT FOR YOU? If you want to increase your intake of antioxidants to stay healthy, and support your weight loss goals, then yes, Body Perfect® Acai Berry & Green Tea is an excellent choice. We’ve got you covered with a wide range of other weight loss products: Body Perfect®, Body Perfect® Raspberry Ketone & Green Coffee, Skinny Protein®, Activeman Thermolean®, Matcha Green Tea Powder, Skinny Water®, Vegan Lean & Green®, Thermogen and CLA. As with all our products, Body Perfect® Acai Berry & Green Tea capsules are made from only the highest quality, responsibly sourced ingredients. What’s more, the Body Perfect® range is manufactured in our own UK-based facilities by an expert team of scientists. That’s how we ensure every bottle is made to the same high standards..
Acai Berry Extract, Green Tea Extract, Gelatin (Capsule Shell), Magnesium Stearate. Take 2 capsules 3 times per day with water. Do not exceed the maximum daily dose of 6 capsules. Most customers report noticing results within one month.